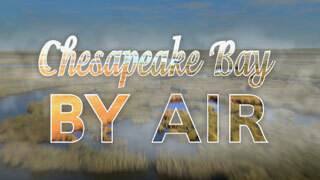 Chesapeake Bay by Air, a one-hour program produced by MPT, forever captures the unparalleled wild beauty, history and natural serenity of the bay, all from above. Chesapeake Bay by Air's meandering aerial journey transports viewers to many of the Chesapeake Bay's countless stunning locations -- from a purple-orange dawn over the Susquehanna River to the mystery of the carved marsh of Blackwater Wildlife Refuge. From the tranquil fishing village of Smith Island to the belching smokestacks of Sparrow's Point, from ancient Calvert Cliffs to bustling small-city Annapolis and metropolis Baltimore, from the mighty steel spans of the Chesapeake Bay Bridge and then to historic Point Lookout, Chesapeake Bay by Air brings the bay into razor-sharp perspective, from well above the din.